It’s the Annual Ambassadorial Ball in Glause, and Lady Isabella Farrah, the daughter of New Civet’s Ambassador, is feeling pleasantly scintillated. In the library is Lord Pecus, a charming gentleman whose double mask hides a beastly face, and who has decided that Isabella is the very person to break the Pecus curse. In the ball-room is young Lord Topher, who is rapidly falling in love with an older woman. And in the card-room, lying in a pool of his own blood, is the body of one of Isabella’s oldest friends: Raoul, Civet’s Head Guardsman. The papers sewn into his sash seem to suggest espionage gone wrong, but Isabella is not so certain. Lord Pecus, as Commander of the Watch, is of the opinion that Isabella should keep out of the investigation and out of danger. 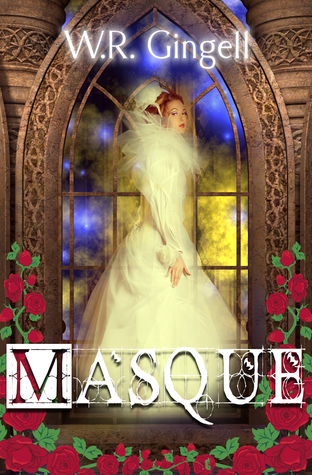 Isabella is of the opinion that it is her murder to investigate, and that what a certain Beast-Lord doesn’t know won’t hurt him. . . .
Will Isabella find the murderer before Lord Pecus does, or will she end her investigation as a bloody spatter on the parlour floor? I liked this book - but let me tell you, it's definitely one I had to turn my brain off while reading. The plot, for the first half borrows almost not at all from Beauty and the Beast. Then, during the second half, we have the Beauty staying with the Beast to save her father, but it's a very original, ingenious twist. Let's talk about what I liked about this story first, shall we. Pretty much full stop. She's got her flaws - though I'm not certain that they were supposed to be read that way and not her just being spirited, but she is a wonderful main character. I'm not usually fond of first person perspective - but I kind of adored being inside her head through the entire story. She's forceful and determined with an excellent sense of humor and a brilliant mind. She likes being an old maid at twenty-eight and takes pride in the freedom her status affords her. She is, in short, a total prize and is well on her way to becoming one of my favorite 'Beauty's'. The world is nice. I like it, though it doesn't really offer much more than the usual standard fantasy fare in a rather Victorian setting. There are moments, however, that strike me - usually when Isabella is talking to her two old friends or her Papa - that I'm missing a story. I looked, there's no previous book following these people. But, sometimes, it feels like there should be. Now for the not so good. Lord Pecus is impossible for me to pin down. He sometimes acts like a highhanded man who is going to do what's best for the poor, helpless woman no matter what. Other times he seems to truly value Isabella's help and admires her mind. (And, seldom but it does happen, he comes across as insecure and vulnerable.) This changing personality left me confused and befuddled as to what to think of him. I'd like to add, he is only ever even slightly beastly by his looks. He's never short tempered or violent or any of the other things that I've gotten used to and usually loathe. So, while he confuses me, that is a good thing. But, still… He is too controlling for me to ever really like him. I finally need to make note about the mystery. To put it as succinctly as possible: I didn't like it. Top Ten 2016 Releases I've Not Read - Yet!